German prince Wilhelm zu Wied (1876-1945) was born of a noble protestant family in Neuwied on the Rhine, situated between Bonn and Koblenz. His mother was Marie, Princess of Holland. An officer in the Prussian army, Wied was a cousin of the German Emperor, and was the nephew of Queen Elizabeth of Romania. He was married to Princess Sophie (1885-1936) of Schönburg-Waldenburg in Saxony. In October 1913, the Great Powers offered him, as a compromise candidate, the throne of the newly independent country of Albania, a land about which he knew very little at the time. After due reflection, he accepted the offer and arrived in Durrës on 7 March 1914 aboard an Austro-Hungarian naval vessel to take the throne of his new little kingdom. The chaotic political situation both within Albania and with respect to relations with Albania's neighbours made it virtually impossible for the well-meaning prince to reign. In addition, as a result of the outbreak of World War I, he received little or no financial or military support from abroad. On 3 September 1914, after less than seven months on the throne, the prince abandoned Albania aboard an Italian yacht, though without formally abdicating. 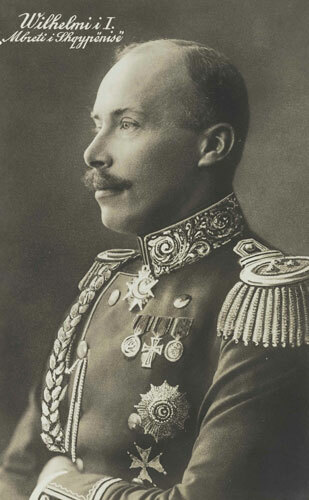 During World War I, he served in the German army under the nom de guerre, Count of Kruja. He had hoped to return to Albania after the war but Germany's defeat in 1918 made such expectations illusory. In 1917, he recorded an eighty-two-page "Denkschrift über Albanien" (Memorandum on Albania), in which he presented his view of his short reign. The Balkan War had robbed Turkey of its province, Albania. The Greeks occupied the southern part of this province, and the Montenegrins the north with Skutari [Shkodra]. The Serbs advanced through central Albania to the Adriatic Sea. Each of these countries thus hoped to fulfil its long-held ambition. At the same time, for another country, Italy, owning Albania meant supremacy in the Adriatic Sea, and for this reason, the country's fate was of great importance to Italy. It was also, and perhaps even more important for Austria-Hungary, which was dependent on a free Adriatic and unimpeded access to the Mediterranean. None of these Great Powers could or would accept any other nation taking over Albania and would not accept its allies jeopardizing the fundamental interests of these Great Powers. The other Great Powers could not close their eyes to the more or less substantial claims which were coming from all these rival interests. Yet they also feared that, if a country which was the focus of such rival interests should not have a proper government, it would be a constant source of conflict among the neighbouring countries and would thus constitute a permanent threat to European peace. They recognised that the best solution to the threat would be a declaration of independence on the part of Albania under an independent monarch. Turkey withdrew in favour of a new autonomous and independent principality to be created in Albania and left the regulation of Albania's borders and other issues related to Albania to the decision of the Great Powers. The sovereign is to be nominated within six months. Until his designation and until the formation of a definitive national government, the activities of the existing native authorities and the gendarmerie will be controlled by the International Commission. The new sovereign was to be proposed to the Great Powers by the two most-interested Great Powers, Austria-Hungary and Italy. The importance and significance which the Great Powers attached to these accords was documented in their unanimous solemn declaration of guarantee. Yet, although Albania was caught up against its will in the conflagration of the recent World War, none of the guaranteeing Powers, up to June 1917, had declared that it no longer recognized the obligations it had assumed with declaration of guarantee. I hereby protest vehemently against the illegal declaration made by Italy on 3 June 1917 to make Albania an Italian protectorate. The creation of an independent country of Albania seemed certain. The Great Powers set up two commissions which were to visit the borders set forth by the conference of ambassadors in London and to delimit them precisely and in a definitive manner. The Border Commission for the southern and southeastern border finished its work, but the commission for the northern and northeastern borders was not able to complete its task due to the outbreak of the World War. Serbia evacuated Albania and withdrew to the boundaries set forth by the Commission, constricting as they were. It did so against its will only because the Great Powers (in particular Austria-Hungary) had threatened repercussions. After the Montenegrins begrudgingly withdrew from Shkodra, the town was to be put under the protection of the troop detachments of the Great Powers to protect it against renewed occupation by the Montenegrins, who were longing to have it back. At the urgent insistence of the Great Powers, Greece, for its part, which had arduously endeavoured to annex Epirus, finally declared itself willing to evacuate this part of Albania if the Albanian gendarmerie could take the region over and ensure peace and order in Epirus. It thus seemed as if Albania's malevolent neighbours had been restrained by the dictates of the Great Powers. In reality, however, hostile forces were constantly at work to impede the development of the new State from the start. The Albanians living on the borders were subjected to constant harassment. The Montenegrins were the ones who kept quiet the most because they were held back by the presence of the international troop detachments in Shkodra; yet they, too, were simply waiting for an opportunity to rise and seize this purely Albanian town again, which they had conquered in the Balkan War. The Serbs, who had received several purely Albanian towns at the Conference of Ambassadors in London, such as Djakowa [Gjakova] and Dibra, made the lives of the inhabitants a misery and forbade the Albanians from crossing the nearby border to visit the markets of the towns, even though this was essential to the survival of these neighbouring parts of Albania (because the terrain did not allow for alternative methods of food import). The Serbs took advantage of the local unrest which this had caused to occupy parts of Albanian territory once again. They murdered everyone of Albanian origin: men, women and children, Christians and Muslims alike, and burnt 28 villages to the ground. In the areas of Epirus awarded to Albania, the Greeks organized local resistance using small Greek factions which opposed the region's incorporation into Albania. The Serbs refused to surrender the parts of Albania they had re-occupied. It was only when Austria-Hungary declared that it was determined to ensure absolute obedience to the London Accord by all means at its disposal and when, on 18 October 1913, it gave the Serbian Government eight days to withdraw from Albania completely, that Serbia deigned to act (cf. "Diplomatic Documents on the Events in the Balkans," published by the Austro-Hungarian Ministry of Foreign Affairs, 1914). Greece, on the other hand, did not budge. It refused to withdraw from Koritza [Korça] and Argyrokasto [Gjirokastra] and caused major problems for the Albanian Border Commission right into 1914. A "Provisional Government of Albania" had been created in Valona [Vlora] in December 1912 under the leadership of Ismail Kemal Bey, which was to take over the government of the otherwise ungoverned country until a definitive regulation was made, i.e. until the election of a ruler. Its influence, however, did not extend far beyond Vlora. It did have significance in one regard, in that it had its hands on the customs revenue in Vlora, the most important Albanian port for imports, and thus disposed of the most significant source of income in the country. It maintained official relations with European governments, as it claimed to be the real provisional government of Albania, despite strong opposition from throughout the country. It also selected the Albanian delegates to the International Control Commission from its ranks. Aside from the government in Vlora, local administrations were also formed in other important towns and regions under the leadership of wealthy and energetic Albanian landowners who accordingly had many followers. Alessio [Lezha], for instance, was under Ded Zogu, Orosi [Orosh] under Prenk Bib Doda, Elbassan [Elbasan] under Akif Pasha, Fieri [Fier] under Omer Pasha, and Durazzo [Durrës] under Essad Pasha Toptani. Shkodra and the surrounding region, for its part, was under the administration of the head of the international troop detachment, the English Colonel Phillips. Each of these local administrations anxiously guarded its sphere of influence, reacted in a hostile manner to the others and endeavoured to extend its control. Those in power were primarily concerned with lining their pockets and getting influential positions in the new country, but managed more or less to maintain order in their regions. The most influential figures in these miniature governments were the sly and resourceful Ismail Kemal Bey who had alienated his own family, was generally regarded as being the pay of the Greeks and was viewed by everyone as having a character not much unlike that of a crook; and the violent and scrupulous Essad Pasha Toptani, who would stop at nothing to get his way. On his return from a dinner party during the siege of Shkodra, this fellow, who was commander of the Turkish gendarmerie and then leader of an Albanian Redif division in Shkodra, had ordered his men to murder Riza Pasha, the brave commander and defender of Shkodra, in front of his very home. It was not long after he became commander himself that he handed the town over to the Montenegrins (allegedly for a substantial sum of money), under the condition that his troops be allowed to withdraw freely and take their weapons and equipment with them. Some of these troops stemmed from central Albania. With these armed men, he went back to Tirana where he owned much land, hoping undoubtedly to use his growing influence to take over Albania himself. He was the only man in independent Albania who possessed a self-contained army, which was comparatively strong for Albanian conditions. It was with these troops that he gained control of all of central Albania. He made great use, in this connection, of his large estates in Tirana and the surrounding region and thus of his many local followers, as well as of his personal wealth and Montenegrin money. All the rest of the nobility in Albania despised him. The central Albanians were more than unhappy with his rule. Conscious of his unlimited power, he called himself the "Head of the Executive of the Senate for Central Albania." He became an immediate adversary of Ismail Kemal Bey and endeavoured to expand his sphere of influence to the detriment of the latter, even using arms. In order to encourage his men to attack the Albanian government in Vlora, in the sphere of which there were almost only Muslims, he told them that the Vlora government was intent upon a Christian sovereign, whereas he would ensure them that a Muslim sovereign would be brought to Albania. Simply in order to expand his personal power, he managed to encourage the Muslim Albanians to fight one another, in particular in the Elbasan region. A certain antagonism between central and southern Albania had thus been created before my arrival. A country without clear and set borders, menaced on all sides by stronger and well-armed foes, divided from within into various districts, ruled and oppressed by ambitious and profit-seeking leaders, and with a people longing for freedom, autonomy and peaceful development - this was Albania at the end of 1913. The old Turkish system based on bribery, tyranny and intrigues had left its imprint on the country after long centuries of Turkish rule. Money and personal interests had created a Greek faction, a Turkish faction, an Italian faction and an Austrian faction in the country. Only the Serbs and Montenegrins were and remained generally despised foes. The selfless and patriotic Albanians were the educated ones who had lived and studied abroad and had seen the blessings and advantages that a functioning government can provide for a country (there are perhaps over one million Albanians living abroad!). These Albanians, representatives of the intelligentsia, formed the core of the national movement for independence. Almost all of them stemmed from the coast and from the cities, where they had influence and enjoyed good reputations. In the countryside and in the mountains, the peasants blindly supported the most prominent and richest landowning families. The peasants, almost all of whom were illiterate, were more than receptive to all sorts of whisperings and rumours. Essad Pasha himself could not read or write. He had the greatest difficulty signing his name. The new Albanian State was like a young lad who was suddenly bereft of upbringing and education by the early death of his parents, and now, with his unlimited freedom, was full of plans and ideas but who did not know how to restrain himself and make reasonable use of his new-found freedom. Nowhere was there any sense of unity, no joint action. On the contrary, there was strong fragmentation, a collision of conflicting personal interests. Yet the seeds had been sown for great deeds; the foundations of a strong and autonomous State had been laid. Albania's condition at the beginning of 1914 can be aptly compared to the Interregnum in German history, the "terrible time without an emperor", which was brought to an end by Rudolf von Habsburg. The authority of the International Commission, pursuant to the London Accords, was to be set forth as follows: "Until the designation of a new sovereign and until the formation of a definitive national government, the activities of the existing native authorities and the gendarmerie will be controlled by the International Commission." It held its first session in Vlora on 17 October 1913. The reports of the German delegate to the International Commission offer a vivid description of the situation in Albania and of the activities of the Commission. Four major governments had crystallised out of the myriad of local administrations, and had expanded and consolidated their positions. Ded Zogu could no longer hold his position in Lezha and Medua [Shëngjin] when Prenk Bib Doda reached for these two towns - his own people would no longer follow him. They did not want a man from their midst as their ruler. Instead, they turned to the English Colonel Phillips in Shkodra and requested that an administration under international control be set up. When the International Commission acquiesced, an Austrian, as well as Italian and English officers took power in this area. Prenk Bib Doda withdrew and has not been seen there since. In Shkodra and the surrounding region, order remained in the hands of the leader of the international troop detachment, the English Colonel Phillips. The general situation in northern Albania was such that one could assume a new sovereign would have no problem assuming power. In central and southern Albania the situation was completely different. Essad Pasha and Ismail Kemal Bey were at loggerheads and were plotting against one another in every possible way. Essad, who was by far the more important and powerful of the two, was endeavouring to expand his rule southwards to Elbasan. Using gifts and promises, he was cunningly able to extend his influence and that of his followers and relatives. He never openly opposed the International Commission, but rather slithered around it like an eel, constantly affirming his loyalty and claiming that he was ever ready to serve Europe and the new sovereign. Even at that time, the reports of the International Commission on his behaviour gave rise to suspicions that he was double dealing and only had the expansion of his power in mind. The influence of Ismail Kemal in the south was in constant decline. He lacked requisite military backing, as opposed to Essad who could rely both on the troops he had withdrawn from Shkodra and on fresh forces. The lack of a unified government had a particularly negative impact on the refugee problem. Numerous refugees from the regions which had been attacked by Serbia and Greece had fled to Albania. In Dibra and Elbasan there were several thousand refugees lacking basic necessities and who desperately needed support. The Austrian, Italian and English governments had offered their assistance but this was by no means sufficient. There was no finance administration serving the interests of the country. Essad Pasha had his hands on the customs duties in Durrës, and Ismail Kemal Bey on the customs revenues in Vlora. The two had thus put the country's main sources of income to the service of their own person needs. Ismail Kemal devoted a portion of the customs revenue to caring for the refugees and to the creation of a new gendarmerie corps, but Essad Pasha refused categorically to devote any public monies he had collected to these two expenditures, which the country so needed at the time. The Dutch officers who, in lieu of the Swedish officers originally foreseen, had been entrusted with the task of building up an international gendarmerie and who were devoting much energy and enthusiasm to this goal, got no support whatsoever from Essad Pasha in central Albania. He only made difficulties for them. He hindered their work from start to finish, making it clear that he already had a good Albanian gendarmerie. The south of Albania was a particular problem. Greece had still not evacuated the occupied Albanian territories. Numerous gangs led by former Greek officers, no doubt (though not proven) supported by the Greek Government, were working towards fomenting uprisings and chaos in the region. In the course of its activities, the International Commission recognised that the elimination of these two powerful figures, Essad Pasha and Ismail Kemal Bey, was an essential prerequisite to bringing peace and quiet to Albania and to enabling the new sovereign to ascend the throne. They recognised that the time was ripe to do away with Essad Pasha and Ismail Kemal Bey because, in their view, the former had become too big for his boots, and the other was responsible for serious mismanagement. This view was strengthened by their involvement in the failed plot of the Young Turks which endeavoured to install the Turkish General Izzet Pasha as ruler of Albania. The International Commission succeeded in persuading Ismail Kemal Bey to resign from his position as president of the "provisional government," for which he was eminently unsuited, but Essad Pasha continued to rule unperturbed as "Head of the Executive of the Senate for Central Albania." The International Commission was in fact an extremely unfortunate creation. It represented the six Great Powers, but had no executive power itself. In its work, it revealed all the contentions existing in the major political issues of the day between the Triple Alliance and the Dual Entente. The Triple Alliance, especially Germany and Austria-Hungary, for its part desired and strove for the development of relations in accord with a unified and consolidated Albanian State, whereas the Dual Entente (France and Russia) represented the interests of Serbia and Montenegro which aimed to enlarge their countries at the expense of an internally and internationally weakened Albania as far as possible. In addition to this was the conflict between Austria-Hungary and Italy, that jealously observed any increase of influence in Albania which the one or the other might betray. All of this could not remain concealed from the attentive eyes of the Albanians. It diminished the reputation of the International Commission, but also that of the Great Powers. The diminishing reputation of the Great Powers was in fact what gnawed at the roots of the young Albanian State. How was a new sovereign, whose power and support rested solely on the reputation of the Great Powers and on respect for their will and determination, to create order in a divided and chaotic country if both of these things were undermined from the very start? The situation becomes clear in retrospect. A glance at the broken promises of the Great Powers makes it evident that only the fulfilment of such pledges could have brought about solutions to the problems in the given situation. When the Great Powers, on the proposal of Austria-Hungary and Italy, selected me to become sovereign of Albania, I was initially inclined to refuse. I was not unaware of the enormous difficulties which would be faced by the new monarch of a country which in many respects still had one foot in the Middle Ages. Every single thing a new country needed had to be created from scratch. It was in early December 1913, however, that I declared myself willing to accept the throne under certain conditions, following repeated urgent requests by the two most concerned Great Powers, Austria-Hungary and Italy. I did so in good faith as to the guarantee declarations and pledges made by all the Great Powers that participated at the Conference of London, and in the hope that I would be able to contribute to an easing of tension in the newly created Albanian State and thus in the Balkans, too. The major conditions I set forth were: recognition by the Great Powers, the agreement of the Albanian people in a deputation, and the guarantee by the Great Powers of a loan of 75 million Francs, which would ensure funding for essential public works and for the setting up of the new State. The loan was of fundamental importance. It was vital to have liquid assets in a country that had been run into the ground by decades of economic mismanagement and that had no functioning taxation system to ensure a modicum of income, not even regular customs revenues. It was evident otherwise that even the best of intentions and the most extreme devotion would not suffice to create stable conditions. How was one to pay for the administrative, tax and customs officials who would be needed, not to mention the gendarmerie to be set up and the beginnings of a small army? Where would the funds come from, which would be required to build roads and highways in order to promote trade, industry and agriculture? I was chosen as sovereign by the Great Powers. The crown was offered to me by a deputation elected by the Albanian people, led by Essad Pasha on behalf of the whole Albanian nation. However, negotiations between the Great Powers on the loan to be jointly guaranteed, were delayed again and again. News on the conditions in Epirus and on the eastern border, and events in central Albania, as received by the authorities from the members of the International Control Commission and the officials of the Austrian and Italian consulates, made the situation seem worse and worse. The situation in the country was on the verge of utter chaos. There was unanimity that a complete disintegration of Albania could only be impeded by the rapid elimination of the country's "sovereignless condition." In order to speed up a definitive declaration of accession to and assumption of the throne, the two most interested Powers, Austria-Hungary and Italy, decided to guarantee an advance of 10 million Francs on the loan jointly guaranteed by all the Great Powers and in principle accepted for Albania. The ambassadors of these two Powers in Berlin informed me thereof. As a result, in a letter dated 6 February 1914 addressed to the ambassadors of all the Great Powers in Berlin, I declared myself willing to accept the Albanian throne definitively. In a letter of 2 March 1914, the Austro-Hungarian Ambassador to Berlin, Szögyény, informed me that not only did the Greek Prime Minister and the Greek Minister of Foreign Affairs believe that a rapid accession to the throne was urgently necessary because of the situation in Epirus, but also Count Berchtold, the Austro-Hungarian Minister of Foreign Affairs, regarded it as "extremely desirable and important to avoid any delay and to take over government in Albania as soon as possible." Preparations for my departure were dramatically accelerated. I arrived in Durrës on 7 March 1914 and was jubilantly welcomed by the Albanians, who had come from all corners of the country. All the towns and most of the villages had sent delegations to welcome me and they assured me enthusiastically of their loyalty. The first few weeks were taken up by establishing a government, by creating a ministry and subordinate offices, by organizing the gendarmerie, centralizing finances and by visiting nearby towns and regions. It was at the beginning of April that the first major difficulties arose. Upon my arrival in Trieste on my way to Albania, I had received initial reports of Greek gangs attacking Albanian border villages, but they did not seem too serious. The attackers were driven back over the border by Albanian gendarmes and local armed inhabitants.. But now, huge gangs of Greeks were once again attacking Epirus and had taken the town of Korça, putting it and the surrounding region to the torch. The whole gendarmerie was to be mobilized against them and reinforced by Albanian recruits. In this connection, difficulties arose once again between Essad and the Dutch officers. Before my arrival, Ismail Kemal Bey had been forced to leave Albania at the demand of the International Control Commission, but the Commission did not have enough power to force Essad to do the same. He thus stayed and only agreed to give up government if he were allowed to lead the Albanian deputation travelling to Germany to offer me the Albanian throne. As head of this deputation, he ensured me repeatedly of his loyalty and devotion. Aware of his power and influence in Central Albania, I strove to keep him in my government by according him special honours and appointing him to a ministry (as both Minister of the Interior and War Minister). Essad seemed to show an interest at the beginning of April 1914 when an order was issued to compile a list of men of military age. Indeed, he claimed that he could muster a force of 20,000 men within a short period and could set off with them to fight the Greek gangs which had invaded southern Albania. But the Greeks, who had at their disposal a very active and effective spy network in Durrës under the Greek bishop, soon got wind of this and sent a Dr. Voilas, who approached Essad and, as I was later to learn, brought him money on several occasions. I now received word that very few men had presented themselves, and most of those who had, refused to go south. As was later learned, Essad had secretly given orders to the contrary, which as War Minister he could do easily, and thus hindered the recruiting of volunteers. The Dutch officers were furious at this and at the constant difficulties Essad created in organizing the gendarmerie and getting volunteers. There were angry exchanges between them and Essad, as a consequence of which Essad offered his resignation, though he never followed up on it. Various persons warned me about Essad who was accused of colluding with the Greeks, of being one of those responsible for the events in Epirus and of hindering the creation of a militia. A few days later, Essad rode to Tirana on the pretext of wanting to urge the men gathered there to march southwards. He stayed there for several days. Two days after his return, I received news that an uprising had broken out in Shijak near Tirana. An attempt by Essad the next day, without my knowledge, to transport a number of machine guns to Tirana, the centre of the territory under his control, was hindered by the Dutch officers. Essad stated that the uprising was of no consequence, but, in the end, ordered his men to march to Shijak to put it down. By this time, the Dutch officers had found out that Essad was himself behind the uprising. He was apparently hoarding ammunition in his house and hiding a large number of armed men there, and had distributed other men throughout the town. Fighting broke out between Essad's armed men and my gendarmes on the night of 18 May. Essad's house was shelled with cannons. This exchange was provoked by a first shot fired by Essad's forces against the men under the orders of the Dutch officers. Essad and his men were taken prisoner by the Dutch officers. All events seemed to indicate that Essad was planning a treacherous coup. No written material was found, and none was to be found anyway because Essad could not read, and even had great difficulty signing his name. I was reluctant to put Essad on trial simply on the basis of oral accusations which could not be substantiated beyond all doubt. What is more, he had immediately put himself under Italian protection, which was granted to him right away. A decision was thus taken to expel him from the country. Before his departure, he signed a document promising on his word of honour as an officer not to return to Albania without my express consent and to abstain from any domestic or international sedition against me and my government. Essad departed immediately for Italy, where he was greeted as a martyr! After Essad's arrest, the rebels, now without a leader, did not know what to do and began to disperse. It was only when they learned that Essad had been released and expelled to Italy and when the Italians, whose automobile (owned by the Italian embassy) was shuttling back and forth to Shijak and the area, had calmed them down and given them instructions, that they brought forth new demands. All the ambassadors, with the exception of the Italian, congratulated me on putting down the coup planned by Essad, and on his expulsion. Telegrams of congratulation came in from all over the country. In Durrës, however, people were disappointed that Essad had been released. The following information should suffice to show what forces I utilized initially to counter the Essad coup and act against the rebels. Aside from the volunteers, the town was defended by 100 armed Malissors [highlanders] who, having heard of the uprising, hastened here to protect their sovereign. Italian and Austrian sailors had gone on land to protect the palace. There was a total of 300 armed Albanians in Durrës, among whom were 200 gendarmes. In addition to this, I had a few machine guns and field guns, which could, however, only be used by a very small number of men, who had virtually no training. I was suspicious of the energetic demands of the Italian ambassador Aliotti to weaken the defence of Durrës even further, the small number of men that they were, by sending home the 100 Malissors. He threatened to withdraw his sailors if his demands were not complied with. He endeavoured to explain the demands by saying that the rebels would react very bitterly if they found out that Catholics had been deployed to protect me. I responded by declaring that I was willing to let them go if international troops were brought in from Shkodra to protect Durrës. This proposal was, however, rejected by the majority of the representatives of the Great Powers. At noon on 23 May 1914, Aliotti came around, greatly agitated, with the news that the rebels, 8,000-10,000, were approaching the town and had killed or taken prisoner 50 gendarmes. They had also captured the four Dutch officers commanding them. Lieutenant Colonel Thomson, the deputy head of the Dutch officers, soon confirmed that the officers in question had been surrounded and taken prisoner while on a reconnaissance tour with their gendarmes. He himself had been compelled to withdraw with his 100 volunteers in the face of the much larger rebel force. Aliotti urged me to go on board one of the ships because he could no longer guarantee our safety. When I refused, he declared that he would withdraw all the Italian sailors from land and that the Italian vessels would not fire a single shot to defend the town. When I countered that I did not regard it as necessary to go on board, Aliotti even threatened to withdraw all personal protection for me and my family. Now, in addition to the ambassador, the whole ministry demanded that I go on board with my family. I refused once again. Soon thereafter, the Austrian ambassador informed me that he, too, strongly advised me to take to a ship because the Italians were secretly collaborating with the rebels to carry out a coup. I then gave my permission for my wife and children to be brought on board to safety until the danger passed. The 100 Malissors refused to leave the country and board a ship without their sovereign. According to Aliotti, the presence of the Malissors did much to provoke the rebels. In order to avoid unnecessary bloodshed and, since my wife had refused to go on board without me, I went with her with the intent of returning immediately as soon as she was on board. Once on board, I felt like a prisoner because, on the admiral's orders, the ship had moved further out to sea and had anchored beside the other Italian warship. So as not to be confronted with a refusal, I first of all ordered that a pinnace be made ready for my return to land, although this order would no doubt have been ignored. It was only when one of the Dutch officers taken prisoner arrived in Durrës, sent by the rebels to negotiate, that the admiral appeared and accompanied me to land in a pinnace. I returned to land although I was not entirely sure that this was not a trap set by the Italians. My wife returned to the palace later that evening. After negotiations with the rebels, we managed to get the prisoners released. The Austrian ambassador, who had also taken refuge on board with his wife, urged us that evening to spend at least the night under the protection of the Austrian vessel because he had learned that the rebels were planning an attack that night. The Austrian sailors were only there to protect the Austrian embassy. He could not be responsible for jeopardizing their safety in order to protect the palace. I rejected his offer, although it was made with good intent. Such were the actual events of 23 May, which were later calumniously exaggerated and distorted by the newspapers. Up to this time, I had counted on genuine assistance from the Italian government in my difficult situation. From now on, I realized that all manner of baseness could be expected of Aliotti. But in view of the Triple Alliance, I was obliged to keep up appearances. Negotiations between the Control Commission and the leaders of the rebels were held on the following days, but they ended without result because the rebels insisted on a Muslim sovereign, as Essad had promised them, or a restoration of Turkish rule. The first days of June brought irrefutable proof of the long-held suspicion that the Italians were colluding with the rebels. On my vehement objection, the Italian ambassador Aliotti suspended his daily automobile trips to the rebels. Instead of this, however, we now observed secret flashing lights used by the Italians to communicate with the rebels. The Dutch Lieutenant Colonel Thomson finally managed to catch three Italians in the act (among them was the Italian captain Muricchio). Documents incriminating them were also found when they were searched. There were great problems with Italy because the capitulations were said to have been infringed upon when the Italian mission was entered by force to arrest them. Pointing to the capitulation law, Aliotti demanded that those under arrest be released, and released they were. Thomson, however, repeatedly rejected Aliotti's other demand to retract publicly the newspaper reports that the Italians had been exchanging signals with the rebels and had been in continuous personal contact with them, insisting that the demand was wrong and that complying with it would be incompatible with his honour as an officer. Aliotti now demanded that Thomson be sent back to Holland, thus depriving the city of Durrës of an industrious and energetic protector. This controversy came to a tragic end soon thereafter with the death of Thomson, which occurred during a fierce rebel attack. The news of the rebellion gradually spread throughout the country. Volunteers arrived from the north and south on an almost daily basis to assist me in combatting the rebels. Within a period of a few days there were over 1,000 men in Durrës. The rebels got wind of this, and of the fact that a further 1,300 Malissors were on their way to reinforce my position. To catch us off our guard, they endeavoured to take the town by force before the arrival of the reinforcements. The most critical day of the whole siege was 15 June. A sudden, energetic attack which was carried out early in the morning brought the enemy up to the first houses in town, where heavy fighting took place. Alas, Lieutenant Colonel Thomson fell at the very start. Our forces succeeded in pushing the rebels back out of town, and by evening they were once again in the positions that they had occupied earlier outside the city. Not only the Dutch officers, but also German and Austrian volunteers using the field guns, distinguished themselves in battle. I was deeply distressed by the death of Lieutenant Colonel Thomson. He had worked indefatigably and in such a self-sacrificing manner to fortify Durrës and train the men. His upright character and his loyalty and devotion were of exceptional assistance to me. From his ties with the rebels, Aliotti must have been well informed about the coming attack, for he appeared in the ramparts above Durrës with all his men at four in the morning when the first cannon shot was fired, allegedly because he had been having bad dreams. Also significant is the fact that by eight o'clock in the morning of the same day, a telegram signed by Aliotti had made its way to the stock market in Trieste, stating that Durrës had been taken by the rebels. We learned of this from a dispatch received by the government, inquiring as to whether there was any truth to Aliotti's telegram (Aliotti's brother was a stockbroker). On 27 June, the rebels suddenly demanded to talk to an English officer. They had obviously learned from their Italian spies that Colonel Phillips was in Durrës. He went to see them alone with his interpreter, but could not achieve anything. He told me that the rebels were insisting on their old demand either for a Muslim prince or that the country be restored to Turkey. The Greek Orthodox clergy had spoken in a particularly hostile manner towards me. Characteristic of the rebellion is a letter from the rebels sent to the town of Berat, demanding its surrender. The letter states literally: "We are united in our action with the Greeks who are advancing from the south, with the Triple Entente and with Italy." This letter reached Durrës on 2 July, sent by the magistrate of Berat to the Minister of the Interior. All the Ambassadors received a copy of it. On 10 July, I delivered a note to the representatives of the Great Powers. In it I explained that Albania doubtlessly had a future, but that it was impossible to work towards the benefit and advancement of the country if the London Accords were not adhered to. And they were not being adhered to. Since my arrival, there had not been one single moment of peace and quiet because the Greeks had immediately occupied the south, the Montenegrins had crossed the border from the north and the rebellion within the country was being fostered by the Serbs, Greeks and Montenegrins. If the Great Powers did not fulfil the pledges they had made in the London Accords, Albania would never be able to develop into an orderly State, and all further activity would be rendered impossible. Germany replied to my note by stating that there was a discrepancy between the allegations of the Albanian Government and those of the Greek Ambassador in Berlin, who declared that no Greek soldiers were fighting in the south. By comparison, it must be stressed that a Greek officer had told the Dutch officers commanding the gendarmes, who were fighting the Greek gangs, that they were fighting against regular Greek forces. Documented statements by captured Greek gang leaders, and photos made of them, left no doubt about it that Greek soldiers were taking part in the activities of the gangs. All of the south including Gjirokastra which had sworn its loyalty to me in a deputation, and Korça had once again been occupied by the Greeks in direct contradiction to the border delineation set forth by the Great Powers. The Greeks sharply rejected the concessions which had been proposed in an attempt to come to an agreement with them. The arrival of countless refugees from the Greek-occupied areas in the south of Albania only served to worsen the suffering. Despite substantial funds to this end, the Albanian Government was not able to ease the suffering on a long-term basis because of the rebellion in central Albania. On 17 July a letter from the rebels which was addressed to the representatives of Russia, France, England and Italy arrived in Durrës (Germany and Austria were not included! ), with a request for negotiations in Shijak. This affront was rejected. The leaders of the rebellion were invited to meet on board a ship, but there was no reply from them. Negotiations only took place with those leading the rebellion (Serbs, Turks, and Essad's people). The simple people did not have a clue what was going on, as we heard from the prisoners and the wounded. They had been forced to take part, for otherwise their houses would have been burned down and their fields torched. In addition to all this, mention must be made of my visit to Vlora on 26 July. A huge crowd came out to greet my wife and me with jubilant shouts of "rroft." On the way from the harbour into town and on the way back, our horses were unharnessed and our carriage was pulled by the jubilant masses for a half an hour in the noonday heat. The town was full of flags. All the dignitaries, clergymen, leaders and deputations whom I had met at the reception assured me of their loyalty and devotion. We were cheered and acclaimed once again during a visit to a refugee camp near Vlora which was sheltering about 30,000 refugees (mostly Muslims from the south which was occupied and ravaged by the Greek gangs). Several thousands of them offered to come to Durrës and fight the rebels. This could not be followed up upon unfortunately due to a lack of funds to feed, clothe and arm them all. The situation in Durrës improved substantially in July. The number of defenders had increased with the arrival of armed Albanians from the north and south, and with the arrival of many German, Austrian and Romanian volunteers, among whom were a good number of experienced soldiers. The town was strongly fortified and could now be considered safe. The patrols were involved in skirmishes almost every day in which the rebels attacked and were always repelled. Our side planned a comprehensive assault on the rebels from the north, the south and from Durrës. The implementation of this plan had to be postponed, however. This was not for lack of men, but for lack of funds to pay, feed, arm and equip them. The Control Commission was constantly creating difficulties in authorizing the transfer of further payments of the loan made by Austria-Hungary and Italy. The situation in which Durrës found itself gave rise to a number of unpleasant problems. The Control Commission constituted a sort of parallel government that not only kept a jealous eye on the scrupulous observation of its authority, which was not clearly laid out from the start, but also on occasion interfered in the activities of the Albanian Government, endeavouring for example to give orders to the Dutch officers. It had become something of a mania for all the Europeans there to start interfering in politics and giving advice. The representatives of the Great Powers were almost always diametrically opposed to one another in their proposals and views, with the Entente and Italy against Germany and Austria-Hungary. In the harbour there was a German, an Austrian, a Russian, an English and a French ship, as well as two Italian vessels. The officers of the ships of course discussed the situation in detail. Their various and opposing views made their way to shore and always found supporters. The more erroneous the views, the faster the rumours found adherents. In addition to this, there were constant conflicts among the Dutch officers as well as between them and the Albanian leaders, as a result of which the Dutch officers tendered their resignation because they felt in this situation that they were no longer in a position to fulfil their mandate. Everyone came to me with ideas, views and proposals and I had to make decisions on everything. We held one meeting after the other, from early morning until late at night, throughout those months. The outbreak of the World War changed the situation in Durrës substantially. All the ships except the Italian ones left the bay of Durrës on 31 July. The German and Austrian volunteers had to return to their troops, and the Dutch officers were ordered back because Holland had mobilized, too. The defence of Durrës had thus been weakened, in particular because there were less men qualified to man the guns; but on the other hand, the situation was generally more relaxed and calm because all those individuals who had been meddling in politics were now gone. The Control Commission met for a last time in full strength on 3 August and authorized payment of the remainder of the advance of ten million Francs. The Austrians and Germans urged me to depart, too, since now, following the departure of the volunteers, the Durrës garrison was too weak to fight the rebels off successfully. I was told I could no longer count on Austrian support and would be at the mercy of Italian intrigues. The situation in Durrës was indeed very difficult. The small remaining force now lacked food and ammunition because Italy had banned all imports and had issued strict export guidelines. The position of Durrës was then further weakened by the departure of the "men from Kosovo," Albanians from the vilayet of Kosovo which was almost exclusively inhabited by Albanians and which had fallen to the Serbs in the Balkan War. These men were the initiators of a movement, not unwelcome in Austria and Germany, to organize an uprising against the invading Serbs. It was, however, too early for this, and indeed this movement contributed to the failures which were later to occur. An aggressive Albanian stance would only have been successful if it had been accompanied by an Austrian offensive against the Serbs. My endeavours in this connection were thwarted by the deeds of the Kosovo men acting on their own. Despite these various difficulties, I resolved to stay in Durrës as long as possible. The most critical problem was money. The Control Commission had authorized the transfer of the remainder of the loan during its last meeting in full strength, but the money was to have come half from Austria-Hungary and half from Italy. But all of Albania's guarantor powers with the exception of Italy were now at war with one another. Italy was now acting as the master of Albania, especially since it noticed how cautiously it was being treated by Austria-Hungary. It openly demanded forest, fisheries and telegraph concessions from the Albanian Government and made the payment of the remaining part of the loan dependent on such demands! There was no choice but to reject the Italian demands since they amounted to the issuing of a bill of exchange on Albania's future, which would not only deprive Albania of some very significant sources of revenue, but would also surrender my country economically to Italy and cut off its economic ties with the other Great Powers. Austria, for its part, refused to carry out its part of the transfer in order not to irritate Italy after the latter's refusal. Austria was later willing to pay, but only if I promised to attack the Serbs from Albania and to invade Serbia, taking advantage of an organized revolt in the district of Kosovo. Even though I felt convinced, as were all Albanians, that these purely Albanian regions unlawfully annexed by the Serbs had to be reunited with Albania, I was not able to provide such assurance in view of the situation. Albania would thus have violated its neutrality, guaranteed by all the Great Powers, and, not being able to rely on immediate Austrian support, it would have been at the mercy of those neighbouring countries, who were only waiting for the opportunity to divide it up among them. Italy, as the last remaining neutral Great Power, seemed obviously intent on occupying Vlora and Durrës militarily under the pretext of supervising the implementation of the London Accords. Negotiations on the money issue continued throughout the month of August. The role of Greece in the "question of Epirus" seemed to have become somewhat more amicable. It seemed to be willing to reach a peaceful solution. It was evidently afraid that Albania (in particular Vlora and the surrounding area) would be occupied by Italy. The information that Turkey had spread on my behalf and for my government contributed substantially to this change of attitude. On the other side of the coin, the rebels in the south had made progress in their march on Vlora. The Albanian government authorities in Vlora informed me that they would certainly be able to hold out because they had enough men, but only if they were to receive money to procure food and ammunition as soon as possible. The many refugees were in a terrible state because of the lack of food. It was the same everywhere: there were more than enough Albanians loyal to me, but there was not enough money. The rebels, for their part, were well supplied with food, money and ammunition. They got their food from the Serbs, who also paid the wages of 2000 of the rebels. Their ammunition seemed to come from Italy because, of the shells fired at Durrës, the duds turned out to be of Italian origin! There was no doubt about that. By the end of August, my situation in Durrës had become untenable, for it was obvious that neither Austria-Hungary nor Italy, which thought it had reached its goals in Albania, would provide any more funds. The coffers of the State were empty. Salaries had not been paid for two months and I had had to pay the troops out of my own pocket the month before. I was no longer able to continue paying their salaries and to purchase food and equipment. For lack of food, money and ammunition, Vlora had surrendered to the rebels, who immediately raised the Turkish flag. There was no one I could count on to support me. Austria-Hungary, which up to then had been my most faithful supporter, had to devote all its energy to defending itself. It was therefore not in a position at that time to care any further about Albania. These circumstances forced me to take the grave decision of leaving my country temporarily until the situation would permit my return. My presence was no longer of any benefit to the country. It was obvious to me that the World War would play a major part in deciding the future of Albania and that only its alliance with Germany and Austria-Hungary would continue to guarantee its freedom and independence. There was no more hope of altering the situation in Albania during the World War without a military invasion of the Balkans and Albania by the Axis powers. When the foreseen date of my departure, 3 September 1914, became known, all the leaders of the Albanians faithful to me arrived and begged me not to leave them, but rather to go to Shkodra with them and continue the struggle against the rebels there. After careful consideration, this plan had to be abandoned. All of northern and eastern Albania had remained loyal to me so that, had I had enough funds, I could have carried on and suppressed the rebels in central Albania from there. The Montenegrins were, however, preparing to invade Shkodra and take the city again. The Serbs intended to occupy the east of Albania. Due to the lack of funds in the State coffers, resistance to the two of them was futile with my small and as yet inexperienced troops, in particular because Shkodra would easily be cut off from all supplies and starved out. In response to all the pleading and urgent requests that were being made of me, I gave my word of honour once more that I would not abdicate, but would work for Albania with all possible means, and as soon as conditions permitted, I would return and personally take over the helm of government in Albania. On 2 September, I convoked the ministers and the three members of the International Control Commission still in Durrës, the representatives of Austria-Hungary, Italy and France, and asked them in a speech to take over the government of Albania, in conjunction with my Albanian prime minister, Turkhan Pasha, for the period of my interim absence. The chairman of the International Control Commission, its Italian representative, replied that they would take on the task. The ambassadors of the Great Powers and the other diplomatic representatives had promised to protect and put under seal the property of the royal family in the konak. It was not possible to pack everything up and ship it back due to the World War. On the morning of 3 September, we left Durrës and sailed to Venice. All those faithful to me left the town, too, and departed for southern Albania, northern Albania or Italy. "Albanians! When your delegates arrived to offer me the Albanian crown, I responded confidently to the appeal of such a noble people who were requesting that I assist them in the task of reviving their nation. I came to you with the ardent desire to help you in this patriotic task. You have seen that I devoted all my energy from the start to reorganizing this country with a view to providing all of you with good administration and justice. Now, unfortunate circumstance have impeded this joint work of ours. Some confused souls, blinded by passion, were not in a position to understand the value of the reforms, and refused to support the new, developing government. And the war that broke out in Europe has made our situation all the more difficult. In order not to leave this work unfinished, to which I have devoted my energy and life, I have decided that it would be useful for me to spend some time in the West. But be aware that, be I near or far, I will have but one thought: to work for the good of our noble Albanian fatherland. During my absence, the International Control Commission set up by Europe, which created our fatherland, will take over the task of government." After a short stay in Lugano to recuperate, I travelled on to Germany. I decided to request that I be allowed to take part in the war in the German Army. Since the independence, autonomy and freedom of Albania depended on the victory of the Axis powers, and the one-time foreign minister in Vienna regarded it as expedient for Albania, the decision became easier for me. It was in full accord with my wish as a German prince and as a former German officer not to sit idly by while my former comrades were on the front and while Germany needed every man it could get in the fight for survival. In a letter to His Majesty, the German Emperor, I stressed that I wished to be indicted into the Army for as long as this might be to the advantage of my country, Albania. On 14 October 1914, I was deployed by the chief of staff of the guard cavalry division as a major in the retinue of the third cavalry guard regiment, and I left immediately for the front.